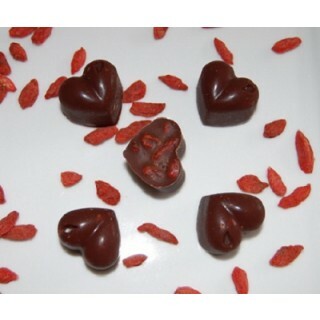 Raw chocolate boasts an intense pure chocolate aroma and and taste. 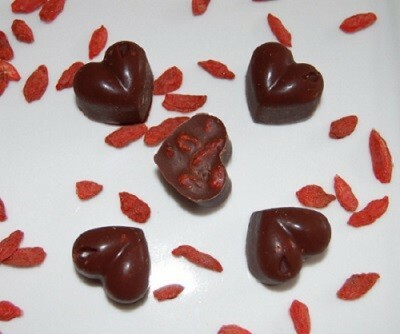 Try using raw chocolate products in this easy recipe that includes goji berries for a decidedly sweet and fruity tasting chocolately treat. Carefully melt the cacao butter first and then add the coconut oil and melt them together and stir together until smooth consistency. (add a small amount of water if needed). Add the honey into the mixture to sweeten . Then add the goji berries into the mixture. Simple as that! When it has cooled down get creative and put in fun moulds for different shapes and sizes. We have opted for some cute little bite sized hearts! Or simply place into a container and pop it into the freezer for approximately an hour. When set, cut up into bar shapes and enjoy! If you love your fruit and nut chocolate, try adding some almonds, cashew nuts or your favourite dried fruits into the mix – get inventive with this fantastic recipe!